Welcome to the New Year! The Tampa Tribune has a new format and has added a new column called "The Right Stuff", hosted by columnist Tom Jackson, to supposedly present a conservative voice to Tribune readers. But what about it's front page? The U.S. Chamber of Commerce is the latest establishment GOP-oriented organization to plan a campaign to prevent extremist (emphasis mine) GOP candidates from winning the party’s primaries, according to a Wall Street Journal report. A Chamber spokesman wouldn’t confirm or deny that. Now back to Tribune article - this is front page news? But the real question at the Eye is what's up with William March and the Tribune's constant fixation with Rubio? Reporting about some Rubio polls is Tribune front page news; Nelson misinforms lies to his constituents about Obamacare and the Tribune ignores. What's really newsworthy is the Senator who really had the bad year. Senator Nelson. Nelson voted for the Obamacare train wreck and he voted to raise federal flood insurance rates. Americans and Floridians are personally feeling the realities of Obamacare that Nelson voted for - cancelled policies, sticker shock with higher premiums, deductibles and co-pays and loss of access to doctors and hospitals. And that's in addition to the chaos Obamacare created in 2013 for the insurance companies and for businesses, especially small business. Tom Jackson's first Right Stuff column is titled Confronting New Realities in 2014 and begins with "the latest permutation" of the Obamacare lie of the year - "if you like your plan you can keep your plan." However, that lie was told not just by Obama but also by all the Democrats who voted for it. "there has been a lot of misinformation out there about exactly what the new law does…." "if you have health insurance now you can keep it"
"And members of Congress did not exempt themselves from any part (emphasis mine) of the law. And in fact members of Congress and their staffs are specifically required by this new law to purchase their health insurance through the state based exchanges beginning in 2014." 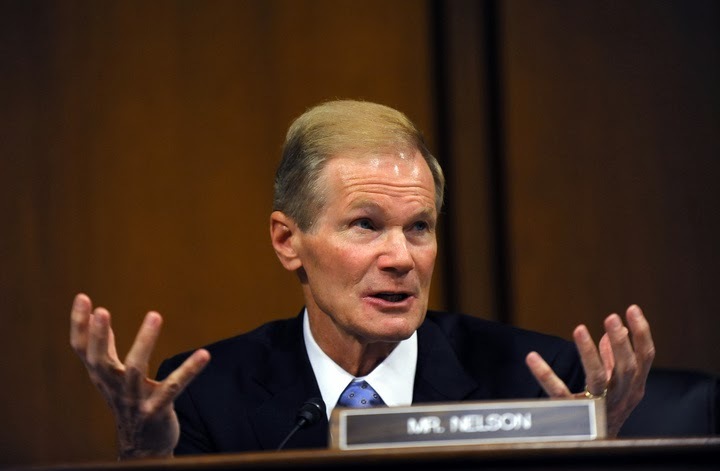 "The so-called (emphasis mine) cancelation," said Sen. Bill Nelson (D-FL), "they're going into a policy that is going to give them protections." Really now.. Think it was "so-called" to the hundreds of thousands of Floridians and millions of Americans who got cancellation notices? Nelson's comment is a disgrace but it reflects the arrogance of the Democrats who passed this disastrous bill because "they" think they know what's best for you and your family better than you do. According to this Wall Street Journal article, Senator Ron Johnson from Wisconsin is filing a lawsuit Over the Obamacare Exemptions for Congress. The law states that as of Jan. 1, 2014, the only health-insurance plans that members of Congress and their staffs can be offered by the federal government are plans "created under" ObamaCare or "offered through an Exchange" established under ObamaCare. Congress established that the only subsidy available to them would be the same income-based subsidy available to every other eligible American accessing insurance through an exchange. This was the confidence-building covenant supporters of the law made to reassure skeptics that ObamaCare would live up to its billing. They wanted to appear eager to avail themselves of the law's benefits and be more than willing to subject themselves to the exact same rules, regulations and requirements as their constituents. 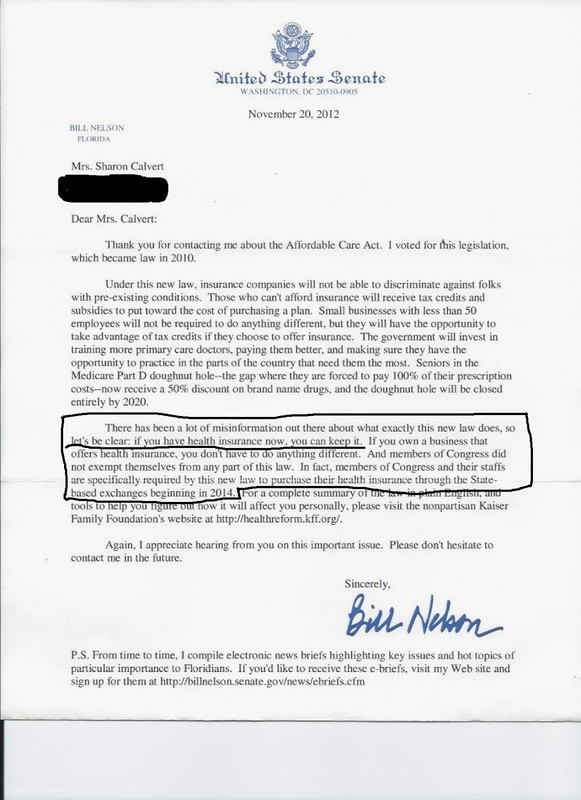 Why did Senator Nelson send letters stating we can keep the insurance we have? Nelson knew millions of Americans were going to get cancellations in 2010. Why did he refuse to address this problem in 2010 when the Republicans attempted to fix it? Why did Senator Nelson send letters specifically saying Congress is not getting any special exemption? Now reality hits and Nelson's "misinformation" that includes the biggest lie of the year is exposed. Isn't this newsworthy? Especially with the rumors still swirling that Nelson may jump into the Governor's race….is the Tribune trying to "protect" Nelson from the Obamacare mess he helped create? We expect in 2014 for the realities of Obamacare to continue hammering individuals, families, businesses and our economy. There is only one Senator in Florida to hold responsible for the Obamacare mess - Senator Nelson. Where's the Tribune front page story about that? The Tribune's fixation is on the wrong Senator! What's Down the Road with Transit?